My gf and I will be spending a week in Puerto Galero this Dec-Jan. We will be diving with Action Divers . As I was checking out their website, a couple of concerns cropped up, so now I have a couple of questions for those who have some experience at PG (or experience in stress reduction techniques). 1) The website trumpets sharks, sharks, sharks. Are there really so many encounters at PG sites? I love to see them, but my gf is a bit wary (she saw a little 1m white tip resting on the bottom in the caverns of The Grotto, in Saipan, and didn't dig it. Last month I got her to hover and check out another there and she was kind of getting into it, but is still pretty leary. I wonder how she'll react if a hammerhead comes swimming by). 2) Most of the sites seem pretty deep (for her). I notice that even a lot of the "Novice" sites list max depths of 25-30m (and beyond). Is most of the diving so deep in PG? Is EAN recommended? Is the visability usually pretty good in winter (makes her more comfortable). I'm just asking so I can let her know what to expect on the trip and avoid any stressful suprises for her (and by extension for me). We aren't going to do any diving that makes her uneasy or that she feels she isn't ready for, but at the same time I wouldn't be upset if she can hang in there in conditions that, now, seem at the edge of her comfort level (ie: more exciting for me!). I know you have most of these answered over on other forums but I thought I'd chime in here as well. 1) Sharks in the Batangas Passage are few to come by in the area unless you go to specific dive sites (ie shark cave in PG or Mainit Point in Anilao). Stick to the many other dive sites (unfortunately you might not be able to check out all of them) and encounters will be very limited. 2) Like many other divers, I have done deep dives (30-35m) and shallow dives in PG (10-20m). EANx is always nice, but not necessary. There are many shallow dive sites to go to and the DMs will be more than willing to show you them. 3) IMO, visibility can be hit or miss depending on the day. Around that time it should be around 10-15m, but can get up to +30m. This happened to me the last time I dove there - the morning dive was about 100ft visibility but by the last dive went down to 30ft. So be prepared for it! ninja edit: oh and if you have some SI time and want a break from diving, you can rent scooters to go to tamaraw falls. An awesome experience! Last edited by chip104 : 09-25-2007 at 11:12 PM. Great Map. I appreciate the advice too. Thanks. My GF will be happy, but I'd rather see the sharks. Have to book my own trip to Malascupa next time! By the way. It's Puerto Galeras. 2.-Large Size fish. I mean never seen bigger lion fishes, puffers, clown fish, etc. I heard the reason why they get so big is because fishing is prohibited. 3.-Didn't see one single shark. BUt did see a large turtle. 4.-Bring a 5mm or 7mm. Water was colder than I expected. 5.-You MUST GO to Verde Island. (40 minutes boat ride) but worthied. 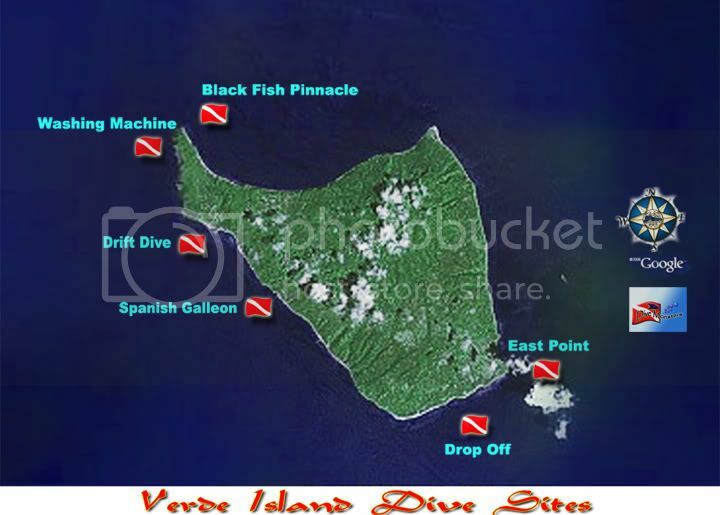 I think maybe the best dive site near that area. 6.-Do as many night dives as you can. Everything changes at night time. 7.-El Galeon. Bar and Hotel. It's so much fun. I think I can keep going and going. I am so jealous you are going there. I really had a great time there. I'll jump in here also... I concur with what everyone else has said. I spent a week there in May. I went with Asia Divers and stayed at El Galleon. Great place. Asia Divers has five schedule boat dives a day, I think more than any of the other operations there. I had a really good time. Something to remember is that the max depth for a particular dive site is not neccesarily the depth you'll be diving to. A lot of the sites drop off into deeper water. Just because a site may start at 30 feet and drop off to over a 100 feet doesn't mean you have to dive the deeper depth... Your guide will base the dive plan on your experience level and where you feel comfortable. They want you to enjoy yourself. A good side trip is to hire a boat to take you to Talipanan Beach about 30 minutes away. There is a really good Italian restaraunt there. If you want to see the sunset you have to go around to that end. The whole Sabang area is on the wrong side of the island for that. I paid 1500 pesos for three hours, but it was during the off-season. Probably more now. White Beach on the way back is a good stop. A good place to buy t-shirts and souvenirs. Tamaraw Falls was dry when I was there, not enough rain. Should be good during your trip. Your hotel can probably arrange a boat and transportation to wherever you want to go. El Galleon was good about that. I have to agree with ScubaMike on Verde Island. 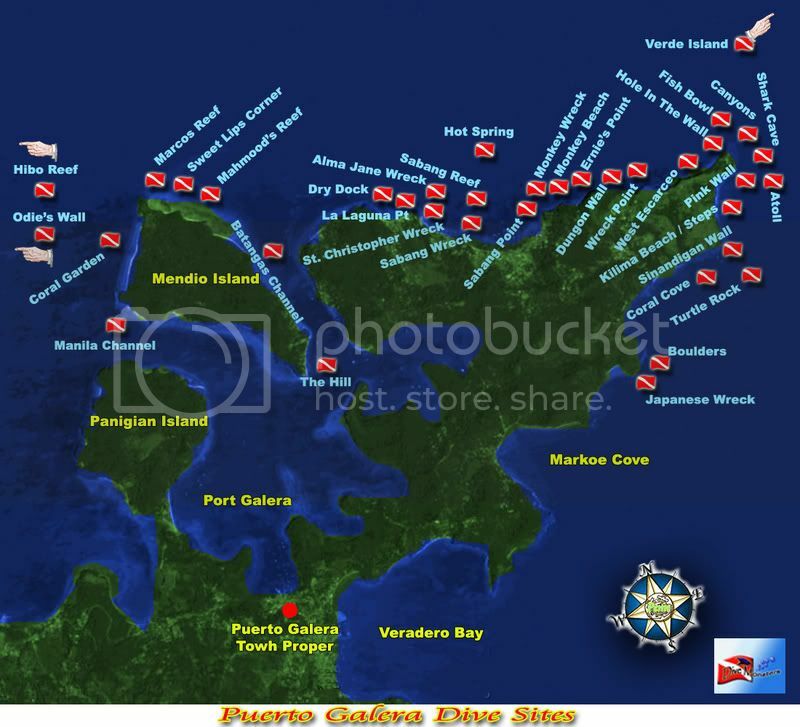 IMO, it is the best and most memorable diving area of all the places I've dived in the PI. And currently it is widely accepted as the center of marine biodiversity of the world. But the currents can be very strong in all the dive sites of Verde so keep that inmind if your GF is not comfortable yet with current (plus there are plenty of sites in PG to enjoy). Oh and it's a bit extra ($) to go to Verde but it is definitely worth it. If you do 2 dives in Verde, I recommend the Pulong Bato site (I think the Westerners named it drop off?). It's my favourite divesite I've dived in the Philippines. Essentially it is a huge underwater peak and the topography is beautiful! There are 2 sides of the peak you can dive and the current will decide which side you dive first (when one side has current, the other won't). In addition to the clouds of small reef fishes there are many schooling fishes here - Jacks, barracudas, yellowtails, emperor fishes... as well as humungous corals (gorgonian sea fans, 6 ft barrel corals) that will truly make you appreciate how mother nature has sculpted the landscape. One side of the peak is a reef wall that levels off at 130ft and then continues deeper. The other side of the peak is a gentle slope with boulders of coral erradically placed (like God was rolling dice while playing Yahtzee) for you to swim inbetween. My description online will not do it justice. I remember diving the reef wall side first, going from one side to the other. Once we got to the opposite edge of the wall we peaked over to the other side (where the strong current was) and saw a school of +40 jacks (each about 3.5ft long) just swimming stationary against the current. It was majestic. We could only peak our heads half way (think of the comic Ziggy) or else we would be swept off the reef with the strong current. After that dive we had a 2 hour SI and dived the other side (the current shifted and was now on the previously dived side). Maybe you can do the same. How much time will you spend in PG? Last edited by chip104 : 09-27-2007 at 10:03 AM. I'm really jealous Bill! Very true on diving in the Philippines. When I get back I have S. Leyte (Whalesharks) and Bohol (arguably the most pristine and best managed site) on my list. Have fun and I look forward to your report. If you do decide to only spend a week in Malapascua, Subic and Anilao are excellent and convenient choices. Depends what type of diving you want to do (wrecks vs. reefs). Personally I'm an Anilao person myself since to truly enjoy Subic it would be better to be somewhat tech certified (I am only AOW). ninja edit: oh and keep in mind that Anilao is a sleepy place (ie not much night life) while Subic is more active. Thanks for all the good info folks. Now I REALLY can't wait for December!